Zoho Creator Sandbox creates a replica of any selected application and keeps it isolated from users and other live applications. Here you can make changes, review them, and then publish required changes for application users. It serves as a platform to perform preliminary testing in a restricted environment, and to publish changes in one go, rather than performing gradual changes in the application. Sandbox is extremely useful in cases where changes have to be made in a complex application and you don't want users to access the application until you are finished, which would otherwise result in users accessing unfinished application changes. Also, sometimes reverting application changes can be a tedious task. In such cases, Sandbox can be used to test and verify the credibility of the changes, to prevent unnecessary last minute changes. The following image demonstrates the role of Sandbox, before releasing application changes for users. Edition: Enterprise, Enterprise Express and Professional Express. Synopsis: Provides an isolated environment to execute and test application changes without affecting the production environment. Let's say you have an application with multiple forms and reports. You want to add a new module in this application containing a few more forms and reports. 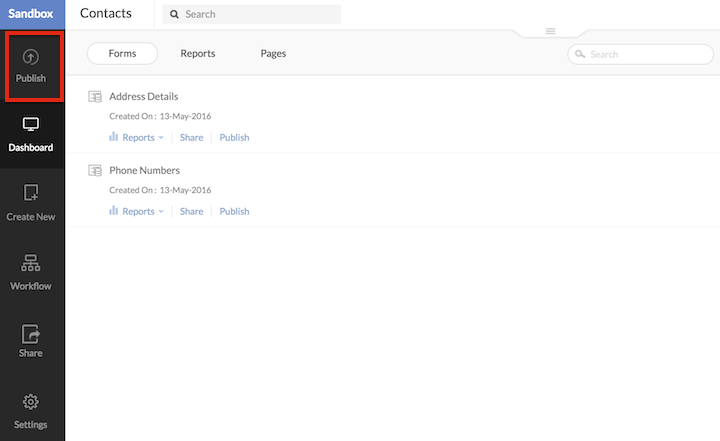 To avoid users from accessing the new module until you are finished, you can add the new module along with forms and reports in the Application's Sandbox version. Now test the new changes made in the application, and see if they are working as expected. Once verified, publish all the changes at once for your users. 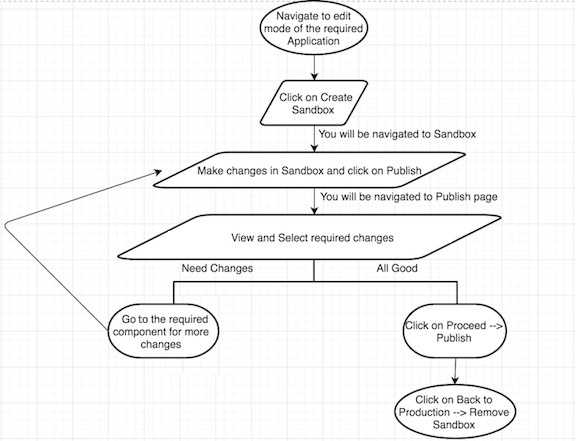 The following Flowchart outlines the step-by-step procedure of using Sandbox. Navigate to the Dashboard of your Application’s edit mode and click on Create Sandbox. Let’s assume we have an application with a form named Phone Numbers to store Names and Phone Numbers. The following image display the Create Sandbox option in the application's dashboard. The edit mode of the application will now be locked. Click on Access Sandbox to proceed. You will be redirected to the edit page in Sandbox. Make the required changes. 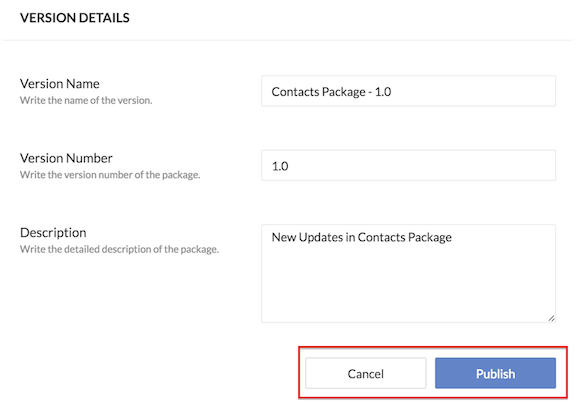 For example, create a new Form named Address Details with fields Name (lookup field type to Name in Phone Numbers form) and Address (multi-line field type). The following image shows the edit mode of application in Sandbox. After making the required changes, you can view how these changes will render in the Live Application by clicking on Access this application. Navigate back from your application to the Creator application's edit page. Click on Publish as shown in the following image after verifying all the changes. Once you click on Publish, you can view all the application changes made in the current Sandbox session. You can choose to select only the required changes you want to Publish. Check-mark the required changes. Click on Proceed as shown in the image below. On the next screen, click on Cancel if you want to go back and review the changes once again. Or click on Publish to make the selected changes visible for your application users. Please note that this will push all the selected changes to the Live Application which will be accessible for your application users. On the next screen, to make a new set of changes, click on Publish New Patch. The set of changes made earlier can be viewed by clicking on the various Package categories. The Sandbox feature is available only to Application owners. While testing an application in Sandbox, the edit mode of the Application is locked. Forms and Fields added in Sandbox mode and published to production mode cannot be deleted in Sandbox mode. To delete, visit the Application's regular edit mode and delete them. Once a session of Sandbox is closed, the changes made in that version cannot be tracked. Whenever a new Sandbox session is opened, it becomes a brand new session with no traces of previous Sandbox sessions. You can make multiple sets of changes in a single Sandbox session and each set can be viewed separately as long as the Sandbox session is running. Each set of changes will be titled as "<Application Name> Package - n.x", where n.x is a variable representing the unique version of each set of changes. To exit Sandbox, click on Back to Production —> Remove Sandbox. The changes made in the application will be visible in the application. Lookup field to other Applications cannot be added in Sandbox mode. Changes in Form Definition and View Definition cannot be made in Sandbox mode. Creating a Form using Form Template and Import options are not supported.